Reality Check: How much of the UK's trade is with the EU? 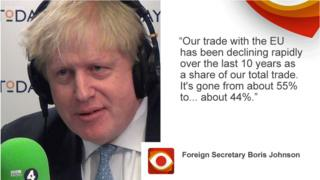 Foreign Secretary Boris Johnson told BBC Radio 4's Today Programme that the UK's trade with the EU had been declining rapidly in the last 10 years and that it had fallen to about 44%. An hour earlier, Sir Martin Donnelly, who was the most senior civil servant in the Department for International Trade, told the same programme: "If we leave the Customs Union and the single market then we are taking away the equal access that we've got to 60% of our trade - nearly half directly with the EU and another 12% or so through EU preferential trade deals." So, how do we reconcile these figures? Well, they're talking about different things. It should also be noted that while the proportion of UK exports going to the EU has fallen over the last 10 years, the value of those exports has risen by about 14%. The figure that Sir Martin Donnelly used of "nearly half" of UK trade being directly with the EU refers to the figure for both exports and imports, which was 49% last year (see sheet C from ONS balance of payments). The other figure he used was that another 12% of total UK trade is with countries with which the EU has deals that free up trade, for example, by removing some tariffs. If you take the countries with which the EU has trade agreements in force you do indeed get to 12% of UK trade. When the UK leaves the EU it will lose those deals and will have to renegotiate them or trade under WTO rules. Boris Johnson also referred to the countries with which the UK has had the biggest growth in trade, in which he included 100% growth in the UK's trade with South Korea since 2010 (again, he is just referring to exports, which grew from just over £3bn in 2010 to just over £6bn in 2016). At least some of the credit for that must go to the EU's trade agreement with the country, which has been in effect since mid-2011. Reality Check: Does the UK trade with 'the rest of world' on WTO rules? Reality Check: Has UK been a relatively unsuccessful exporter to EU? Reality Check: Is 70% of UK trade with non-trade deal states?